As soon as fresh fruits and vegetables come into the house from the backyard garden or farmers market, we usher in a pest along with it: the pesky fruit fly is just waiting to prey on all of our delicious goodies! 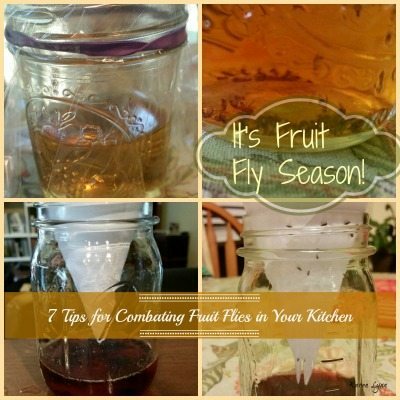 I think you all would agree with me that it is fairly frustrating when you reach for a piece of fruit that is soft and mushy with fruit flies flying around it – or worse yet an infestation of fruit flies! We have experienced that unpleasantness during canning season in years past. There is a reason so many high school classes use them for experiments on life cycles: they multiply fast! If you are new to homesteading or canning and preserving your own food you may be thinking, “What on Earth do you do with these pests?” Fruit flies are relatively harmless but not to those of us who are proud of our beautiful canned goods and clean kitchens! First, I tested two different D.I.Y. style fruit traps. Both are natural and use similar concepts to entice and trap the flies. The first trap is simple and all you need is a glass or jar, plastic wrap, vinegar, a rubber band and a toothpick to poke the holes. You place vinegar in the glass or jar, cover top with plastic wrap, wrap a rubber band around it to secure it in place, poke some holes in the top for the fruit fly to get trapped and voila’ you are all done! The best part about this trap is that the flies come to their demise rather quickly and it’s a little easier to set up. This trap is good overall and inexpensive. However, I think the cone trap has proven to us to be more effective with its one downside which I will explain next. The cone trap is even simpler! All you need is a little wine and fruit placed in a jar or trap. For this experiment I used some blueberry jam and wine. In my opinion, wine attracts fruit flies more than vinegar. However, if you don’t have wine on hand, vinegar will do just fine. Place it all in a glass or jar and make a cone with paper. The smell attracts them and they become trapped down at the bottom of the cone. With the cone fruit fly trap, you need to have a little bit more skill. The cone must be rolled and placed precisely in the jar so the bottom doesn’t touch the liquid . It may also take an attempt or two to make sure you don’t have any air leaks in the side. I have also seen the soda bottle fruit fly trap but haven’t tried this one yet but the basic concept again is similar: entice the fly and let them die. I am hoping to try the DIY soda bottle fruit fly trap out this summer. There are commercial fruit fly traps, but I have not tried any of them. We are a very budget conscious household, and if we can do it ourselves, we do. It’s just part of our self reliant spirit. Once they take hold, it is very easy to give up and throw in the towel…but don’t do it! When it reaches crisis mode and you are in a full blown fruit fly infestation, here are some tips and strategies to help you cope. Put all fruit in the refrigerator, a cooler, sealed bags, or in any sealed environment. Do the same for any sweet items, especially bananas, tomatoes, and even eggplant. Set out your traps. You may need several because once the fruit is gone, the traps will be their only choice for “food”. Keep a vacuum in the kitchen, plugged in and ready to go. If they are all in one area, you can vacuum them up. Just be sure to dump out the vacuum right away. Truthfully, fruit flies are part of life for those of us who can and preserve our own food. Developing habits to prevent an infestation is best. Prevention is far more valuable than strategies and tips to trap them. Don’t let ripe fruit sit out too long. Freeze it, preserve it, dehydrate it, or eat it! Hope these ideas helped you and Happy Canning Season! We are living in a tropic climate and I guess fruit flies are always in abundance here. That might be about the way they sell the “fresh” produce. It is in quotes because it is not that fresh always.. We still don’t have a fridge so I designed this vintage inspired kitchen cupboard and had our local carpenter make it for us. It is basically open on three sides covered with mosquito net. I have less problem this way. I have tried traps like this and the “flies” never go in the plastic! I have used apple cider vinegar in a plastic cup with a couple drops of dish soap in it. The soap makes them sink to the bottom and drown. I work in a scientific research facility where we work with fruit flies. Fruit flies are escaping all the time. We make traps similar to those above that use the paper cone funnels with one very tiny hole at the bottom. Instead of vinegar or wine, we fill the bottom of the container with fly food that consists of corn meal, molasses, yeast and water. Yeast alone works well too, and is what I use at home. Mix yeastwith a bit of water, tape the paper cone to the container so fruit flies cannot creep out around the funnel You can use one trap for about 10 days before the flies larvae start to hatch into new adult flies. Dispose by placing the container in the freezer for an hour or so before washing the whole mess down the drain. You don’t really need the plastic. I use those tiny pyrex custard cups, put a small amount of Apple cider vinegar in, add a drop or two of dishwashing liquid and set it out. (I don’t fill more than half full) They flock to it, dying quickly. You have to replenish it when it gets low, otherwise they can just climb out if it isn’t too ‘deep’. Sometimes I leave the dead ones in, just adding more vinegar and dishwashing soap sometimes I clean it all out and start over… But it sure attracts them, and once they are gone, I leave it out just to make sure all the ‘babies’ have hatched. One help I found when I had a lot of tomatoes sitting waiting to ripen to be canned was to cover them with a towel and sprinkle it with a lot of dried basil. That seemed to confuse the fruit flies and when I lifted the towel the next day there wasn’t a single fruit fly on the tomatoes. (There were way too many tomatoes to fit in the fridge.) That would help in situations where there isn’t refrigeration. I’ve tried all of these at some point. The best thing that worked for me was to put an inch of cider vinegar in a small cup or glass and add a few drops of dish soap. The soap breaks the surface tension so the flies can’t land on the vinegar without drowning. Works beautifully! We found, after several experiments, a soda bottle, with a cone, and a little (very cheap) white wine with 1 small drop of Dawn detergent works great. When there’s a bunch of flies inside, you can very quickly remove the cone, replace with the palm of your hand, shake till all the flies are wet and in the wine, replace the cone, then we get even more flies as the wine is on the walls of the bottle too, smelling tasty. After 1-3 shakings, just pour flies down the sink, rinse bottle and repeat. We didn’t have a big infestation, and ran out of flies within a week. The husband had fun running his ‘trap line’ of 2 bottles, and trying different things. This is a good preventative measure but once infested it can’t cope. Even pest control services can’t get rid of them. The best fix for this is poisoning their water source. They may be attracted to fruit but they must drink water. The solution is easy but must be done for 2 weeks to kill the eggs. Just add a cap full of bleach to every drain after each use for 2 weeks. Also put a cap of bleach in the evaporator pan under the refrigerator once or twice over the two weeks. I have seen many people fight infestations with wine or apple cider vinegar. This is the only way I’ve seen them eliminated. Every time I was thanked for telling them how to get their kitchen back.